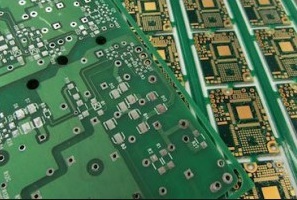 What's the preferred PCB surface finish within the industry? During the design phase of a printed circuit board one of the decisions that needs to be made is what surface finish to select. Unfortunately there's no one "best" PCB surface finish and all finishes have both good and bad points. Selecting a surface finish is a matter of making a decision based on trade-offs that are most appropriate for the intended use. The most widely used surface finish is HASL (Hot Air Solder Leveling). The process in which this is produced is by dipping the PCB into molten solder and then the excess is cleaned off using hot-air knives to leave behind the thinnest possible layer of solder. It's generally the cheapest finish available and a great choice for general-purpose boards. One downside to HASL is that even after the hot-air knife has cleaned off as much excess as possible, the meniscus of the solder will still cause the edges of pads to be slightly rounded. This can cause parts to not place accurately and also cause vision problems with fiducial marks. The biggest advantage of an OSP (Organic Solderability Preservative) finished board is the price. OSP boards tend to be cheaper than those fabricated with other surfaces such as HASL, Immersion Silver or ENIG. Another advantage that OSP has, particularly as compared to HASL finished boards, is the flatness of the pads. The issue in the past with OSP was that the coating didn't hold up well to multiple heat cycles. Over the past 10 years or so there has been an improvement in this area but careful storage of PCB's should still be considered. The ENIG (Electroless Nickel Immersion Gold) PCB finish does tend to be the more expensive finish but does give the best results with respect to its solderability, corrosion resistance and being flat. It consists of an underlying layer of nickel with a thin layer of gold over the top. The gold layer is very thin and not intended to provide the main structure of the track, it just acts as a protective coating for the nickel to prevent it tarnishing before it's soldered. Gold is extremely resistant to corrosion so ENIG has several good points: it can be touched with bare fingers without tarnishing, has a very long shelf life, and the pads / tracks are very flat and square-edged - something that can be important for fine-pitch surface-mount parts. Immersion silver PCB's are flat and generally cost less than ENIG but have more handling, packaging and storage requirements leading to a shorter shelf life. The problem is that it tarnishes quickly and is adversely affected by touch - quite often the silver finish changes over time and can be seen as having a rainbow effect. As long as the manufacturers guidelines are followed then silver PCB's are a cost effective solution but there are the extra quality concerns that should be considered. And the preferred surface finish is . . .
All of the available surface finishes have their benefits but in general the preferred surface finish within the industry is ENIG because of the long shelf life, tarnish resistance, RoHS-compliance, and easy soldering compared to other surface finishes. It is more expensive than Silver but overall the results are worth it.